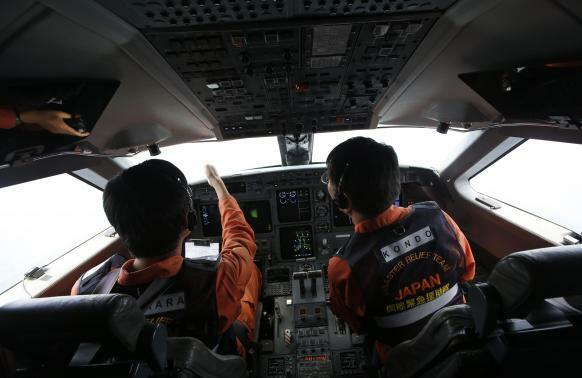 REUTERS — Investigators believe someone aboard a missing Malaysian airliner deliberately shut off its communications and tracking systems, turned the plane around and flew for nearly seven hours after it vanished, Prime Minister Najib Razak said on Saturday. Shortly after the prime minister finished speaking police arrived at the home of the missing aircraft's pilot to search for evidence, a senior police official told Reuters. As the unprecedented search for Flight MH370 and its 239 passengers and crew entered its second week, Najib told a news conference that the hunt for wreckage around the scheduled flight path to the east of Malaysia was being called off. "Despite media reports the plane was hijacked, I wish to be very clear, we are still investigating all possibilities as to what caused MH370 to deviate," Najib said. But investigators have increasing focused on the possibility that it was flown off-course by the pilot or co-pilot, or someone else on board with detailed knowledge of how to fly and navigate a large commercial aircraft. Police officers arrived at the home of the captain, 53-year-old Zaharie Ahmad Shah, on Saturday afternoon. A senior police official told Reuters they had gone to take evidence that could help with the investigation. About two-thirds of the passengers on board the flight were Chinese, and Beijing has been showing increasing impatience with the speed and co-ordination of the Malaysian search effort. On Saturday, China said it had demanded that Malaysia keep providing more thorough and accurate information, and added that it was sending a technical team to Malaysia to help with the investigation. Najib said new data showed the last communication between the missing plane and satellites at 8:11 a.m. Malaysian time. That is almost seven hours after it dropped off civilian air traffic control screens at 1:22 a.m. last Saturday, less than an hour after take-off. It was flying across the mouth of the Gulf of Thailand on the eastern side of Malaysia towards Vietnam. Najib said satellite data confirmed that an unidentified aircraft that later appeared on military radar off Malaysia's west coast before going out of range at 2:15 a.m. was flight MH370. "Up until the point at which it left military primary radar coverage, these movements are consistent with deliberate action by someone on the plane," he said. He said analysis of the plane's last communication with satellites placed it somewhere in one of two corridors: a northern corridor stretching from northern Thailand to the border of Kazakhstan and Turkmenistan, or a southern corridor stretching from Indonesia to the southern Indian Ocean. Those corridors represent a satellite track, which appears as an arc on a map. The plane did not necessarily follow the corridor, but was at some point along its path at the moment the signal was sent. Earlier, a source familiar with official U.S. assessments of electronic signals sent to satellites said it appeared most likely the plane turned south over the Indian Ocean, where it would presumably have run out of fuel and crashed into the sea. The other interpretation was that Flight MH370 continued to fly to the northwest and headed over Indian territory. The source added that it was believed unlikely the plane flew for any length of time over India because that country has strong air defense and radar coverage and that should have allowed authorities there to see the plane and intercept it. Two sources familiar with the investigation in Malaysia told Reuters on Friday that military radar data showed the aircraft following a commonly used commercial, navigational route towards the Middle East and Europe. That course - headed into the Andaman Sea and towards the Bay of Bengal in the Indian Ocean - could only have been set deliberately, either by flying the jet manually or by programming the auto-pilot. The disappearance of the Boeing 777 - one of the safest commercial jets in service - is shaping into one of the most baffling mysteries in aviation history. It is extremely rare for a modern passenger aircraft to disappear once it has reached cruising altitude, as MH370 had. When that does happen, the debris from a crash is usually found close to its last known position relatively quickly. In this case, there has been no trace of the plane, nor any sign of wreckage, as the navies and military aircraft of more than a dozen countries scour the seas on both sides of peninsular Malaysia.